New and improved media features: pervasive RDB disk support, shared drives, deployable large disk images, etc. All Windows versions now come with a Windows Installer download (no need to burn or mount an ISO image to access the installer, or to wait for postal delivery). Enhanced Title Editor, with new media mount options and dozens of new features. Improved player interface with access to RP9 extra content, enhanced image preview, multiple web links (including external content sites), audio files, etc. New user interface features to more easily swap disks, insert blank disks, grab screens, apply existing screenshots, etc. Enhanced Export to Device functionality to save games to SD card, etc. * May indicate Plus Edition and Premium Edition Features. The Express Edition and Value Edition may be limited to configurations that use certain 1.x ROMs, and include fewer games and demoscene productions out of the box. Gallery items and KX Light support are included only in the Plus and Premium Edition. Video content is included only in the Premium Edition. Features describing the "player" refer to the Windows version. 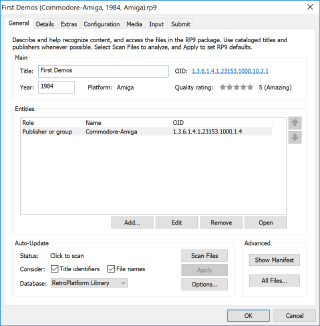 Plus Edition and Premium Edition Amiga content is also usable on other platforms, with additional software (both included and available for download elsewhere).